A new material developed using aerospce technology, named 'Aerogel', is now said to be the highest insulating material in existence. Therefore it only makes sense to use it in some format within the buidling industry as long as the cost is right. Thermablok™ have been developing an amazing product using the latest state of the art NASA technology that may soon become a requiirement in the building industry. Aerogel, also referred to as 'frozen smoke', has been difficult to adapt to most uses due to its fragility. However the patented Thermablok material has overcome this issue by using a unique fibre to suspend a proprietary formula of Aerogel so that it can be bent or compressed whilst still retaining its amazing insulation properties. Just one 6.25mm x 38mm strip of Thermablok added to each stud before drywall breaks the 'thermal bridging' effect and can increase the thermal insulation factor of a wall by over 40%. "Thermal transmission is greater through solid objects, and of course, the least through air or a vacuum. Thus, in a regular wood or metal stud wall, the area that continues to conduct thermally are the studs which mechanically connect one side of the wall to the other. On an infrared thermal test of a wall, the studs show up very clearly as the points of conductivity. 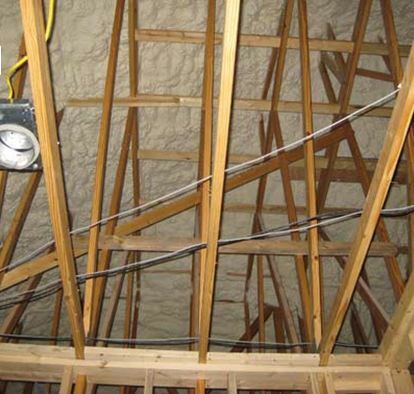 Thermal bridging is the prime energy loss in a building. 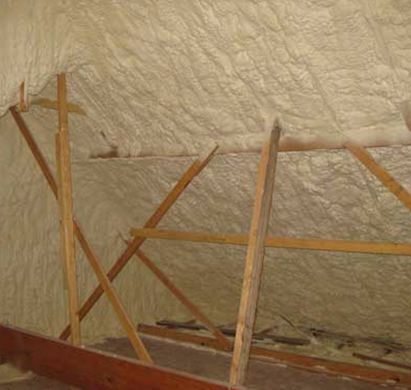 As the Thermablok Aerogel material is 95% air, and is between the stud and the drywall, it breaks the mechanical connection (thermal bridging) exceptionally well." Mark Nothstine, Head of Research and Development at Acoustiblok. As recently reported on the "Science Channel", Aerogel will be the breakthrough in building energy conserving buildings. Nothstine also stated, "The thermal increases achieved with Thermablok will provide continuing cost and environmental savings. 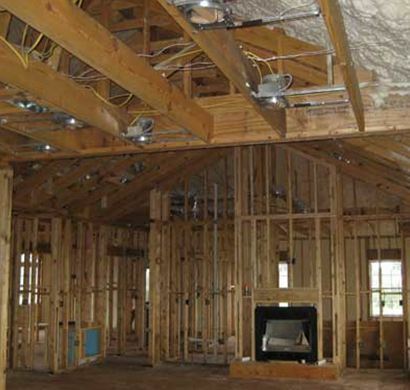 As an example; in a Midwest residential home (USA), 220m² with 400mm on centre stud framing, R13 insulation and wood siding should result in a $746 per year in energy cost savings with a reduction of 3.9 tons of CO2 emissions. Add to this the many tax deductions offered by the government and you would recover your entire cost in the first year." Not effected by age as it does not react with moisture or the atmosophere. 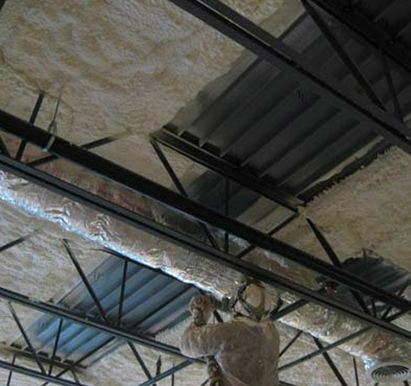 Spray-in-place, polyurethane foam insulation is a product that significantly increases the energy effieciency and comfort of structures. Spray polyurethane foam expands in the wall or inside the roof cavity to completely fill all spaces and is therefore a highly efficient seal against air infiltration which is the number one source of energy loss. 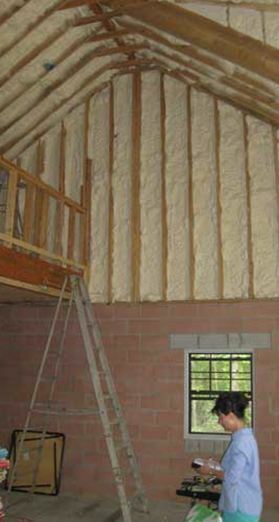 The two basic types of insulation foam manufactured is an open cell semi-rigid foam and a closed cell rigid foam that provides a sealed thermal envelope that can simplify construction practises. 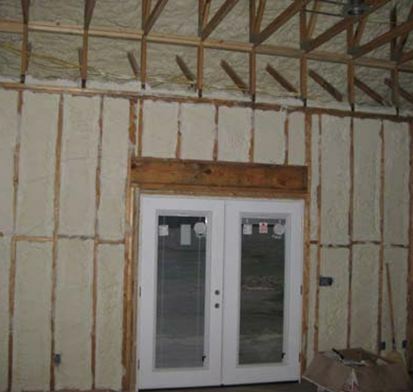 Using spray foam also allows the use of smaller, less expensive heating and cooling equipment. 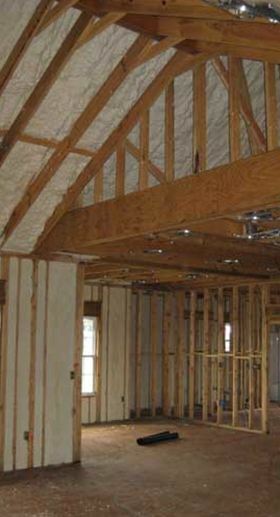 It can eliminate building wrap, caulking and taping, and the labour-intensive work associated with air-tightness detailing required when insulating with conventional products. AIT spray foam offers overall better thermal performance at the same net cost as other products. 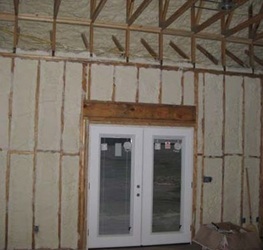 Conventional insulation can lose its insulation value if water or moisture invades the wall cavity and when outside temperatures drop below 30°F. 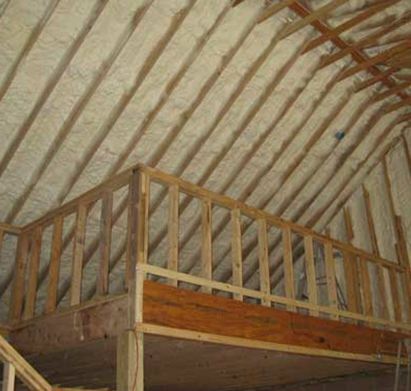 However AIT spray foam is not affected by moisture, it will not settle, it does not support mould growth, and it offers no nesting materials for rodents and insects. This review states that a main particular concern in the building industry is that setting an upper limit of 0.30 W/m²K for wall U-values may have an adverse effect on house building. Although 0.30 W/m²K is the current element standard for wall U-value, many builders acheive compliance with 0.35 W/m²K. It is believed that the attainment of a U-value of 0.30 W/m²K would mean an increase in conventional wall thicknesses of atleast 50 mm. That therefore may have implications for the density of housing units on a development site. The Solution... to introduce and incorporate renewable energy features into the design to compensate for and reduce the increased CO2 emissions. The list of these solutions and their effects on a typical 2-storey, 3-bedroom detached dwelling with a total floor area of 100 m² is shown to the left.